The sun sets rapidly Downeast in the winter—especially after school. In the waning light, snow, and cold, an intrepid group of 4th-6th graders at the Peninsula School explored the forests around the school for ways that they could give back to their community. The students bounded through snow to find birds, trudged through mud in search of animal tracks, and combed through the woods to collect trash. These explorers were unstoppable. This article summarizes the second half of this program; to read about the first half of this program, read our article about it here. Towards the end of the eight weeks, the students had collected enough information about their schoolyard to develop a project to give back to the community. They noticed that around the woods there were plenty of signs of birds, but few birds actually made themselves visible. It was clear to the students that the school would benefit from having a space on campus where classes could go to observe the birds. From science to art, having a bird observation area on campus will allow students and teachers at the Peninsula School to easily integrate nature into their curricula. The students next grappled with how to get birds to a viewing area. The woods around their school had a stream, plenty of cover and a diversity of habitats--all things that birds need in an area except... “Food!” one exuberant student described, was necessary to attract the birds to a viewing area. 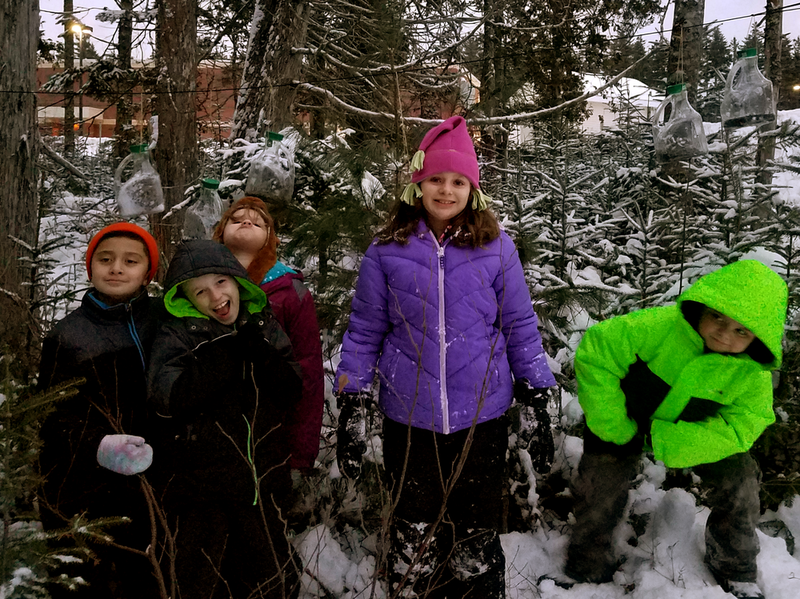 By using recycled juice bottles, the students created bird-feeders and strung them on trees at the edge of the woods near the cross country trail. From exploring the ways different living things modeled resilience around the school in November to applying those models to their own lives as winter wore on, students recognized that building bird-feeders would be a perfect way to get their schoolmates to learn from nature too.